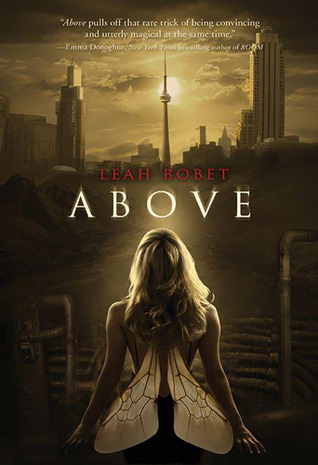 Today's Feature Friday author is Leah Bobet whose debut novel, Above, just released at the beginning of this month! Leah is officially the first Feature Friday author that I've never personally met, so we'll all be learning a little more about Leah through this interview. So far, we know: Leah's short fiction and poetry have appeared in Realms of Fantasy, Strange Horizons, The Year's Best Science Fiction and Fantasy for Teens, and nominated for the Pushcart Prize and the Rhysling Award. She received a 2008 emerging writers’ development grant from the Toronto Arts Council. She lives in Toronto, Ontario where she drinks tea, wears feathers in her hair, and plants gardens in back alleys...We genuinely hope the faeries don't kidnap her. This is probably a very common question when you’re interviewed, but since some of the readers may not have read any of your past interviews, what was your inspiration for ABOVE? There were three or four elements that came together to form the idea for ABOVE. The first was reading an essay in Eli Clare's Exile and Pride; it was coursework for a philosophy class in the third year of my university degree. The author was describing how his disability was diagnosed, and there's a paragraph about having to stand, barely dressed and in pain, under bright lights for what felt like forever while the doctor used the diagnosis to teach medical students. It's one of the most effective pieces of writing I've ever read: it's full of shame and display and hurt, and it hit me right between the eyes. The second thing was me getting kind of annoyed with the whole cliche of outcasts living underground and how it's treated in fiction and TV. For one, there are lots of people who'd have better reasons to want to live outside of society in a safe place, a place where they weren't marginalized or discriminated against, not just people with imaginary mutations. And living underground wouldn't be fun or easy: so many TV shows had reliable technology and marble floors and people who were suspiciously clean living in secret. Really, you'd be stealing canned food all the time and every bad cold would turn into pneumonia. The third thing was something I'd been wondering for a while: when you stop trying to save someone from themself. When constantly bailing someone out, saying it was okay, being supportive and taking time to help didn't actually mean they'd get better, but that they'd just pull you into trouble that neither of you could get out of. Those three things came together once I finally got a hint of Matthew's narrative voice, and while a lot of other issues came into the book later, that was enough for a start. What advice would you give to a budding author? I think mostly to be patient with yourself and your process, and to remember that this is supposed to be fun. Learning to write well-crafted fiction takes time, mostly because you usually can’t see how much you still have left to learn – and this doesn’t change after your first novel comes out! I was writing with an eye to publication for nine years before ABOVE sold, and that’s actually pretty normal. So, it’s entirely possible what you’re doing is going to take a while, and there’s no cheat sheet around that: just remember, always, to have fun doing it and make sure it’s a positive part of your life, even when it’s hard. The cover for ABOVE is amazing! Do you love it? Does it look how you thought it would? How to you feel about Ariel being on the cover and not Matthew? The cover’s breathtaking – it’s a terrible cliché, but I literally sucked in a breath the first time I saw it – and I do indeed love it, and it’s nothing like I pictured. The idea of a cover I had in my head was something more like Holly Black’s TITHE or VALIANT; that stark black and brightness combined. And when I got this, which was something I’d never dreamed of…well, it explains exactly why it can be a very good thing that authors don’t make any decisions about the covers of their books. It’s much, much more suited to the book than what I was thinking, and it’s lovely. As for Ariel being on the cover instead of Matthew: that doesn’t really hit me one way or the other. I worked for four years in an independent bookstore, and one of the things you learn seeing so many books go through your hands is that covers aren’t really supposed to show you exactly what’s going on in the book, they’re supposed to show you what kind of book it is. So for example, if a hard science fiction novel has a cover with a spaceship, even if there aren’t spaceships, it’s still sending a message that says, “Hey, look! Readers who like science fiction! You might want this one – it’s a book like the ones you like!” Covers are, well, signals. 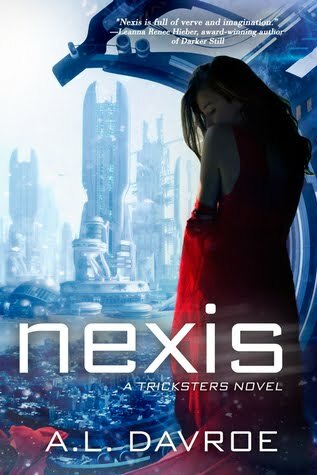 Having Ariel on the cover sends a few of those signals, telling people this might be a book that works for them. So I’m perfectly happy with that happening. Who is your favorite character in ABOVE and why? I have a bit of an extra fondness for Jack. He’s the smartest one there, really: He sees everything that’s going on and knows the score entirely – and he’s been breaking any rules he didn’t like for years -- but he also knows when to stick his nose out of something. He’s got himself together, basically, which is pretty rare with this cast of characters. Also, he swears like a pirate. Why a bee for Ariel? You know, I couldn’t even tell you. It just fit her: Bright and soft and fragile and viciously tough. Some things about a story, for me, just are, and this was one of them. The main character, Matthew, has a very particular kind of voice. Did you create his voice on purpose? Did you just fall into it? Did it take a little practice? Matthew’s voice is another thing that just came with, although when I look back, I’d been experimenting with that kind of voice in different short stories and projects for years. If you want to see an earlier version, a dry run almost, there’s a post-apocalyptic short story called “Six” in the Clockwork Phoenix 2 anthology that I think was my first crack at that weird-grammar young boy’s voice. It did pretty much just fall together when I started writing – it was the thing that let me start writing, the last puzzle piece I needed – but it also took some practice, and some work: I was overdoing it a bit in the early chapters, and had to smooth it out in my second and third drafts, once I’d figured out the exact feel I was going for. Are there any authors/novels that you feel have inspired you and your work? Plenty! We take something out of everything we read, I think, even if it’s just an argument, or I wouldn’t do it like that. Especially the arguments. Some of the authors who inspired ABOVE, though, aren’t yet publishing novels or are out of print. Some of the voice and style are inspired by my friend Amber van Dyk, whose short stories are available here and there, and who is one of the most unique prose writers I’ve ever seen. I wanted to do something a little Amberlike when I started ABOVE. And I wanted to do something practical, something that showed how it would really be to live underground secretly, because when I was probably ten I read this series called Night-Threads by Ru Emerson, where people got transported into a magical fantasy world to depose an evil upstart duke, and…ran out of coffee. And aspirin. And had to figure out how to defend themselves against armed swordsmen, because the protagonist was a lawyer and had never taken weapons classes, and you don’t pick those things up overnight. I loved the practicality of that. It shows up a bit in everything I write. If you could choose your Curse, what would it be? Hah – if I chose it, it wouldn’t be a Curse. It’d be a superpower. The whole point, with Curses, is that you don’t get to choose the things your mind or body is going to do, but people are going to act as if you could, and did. And it’s left to you to deal with that as best you can. You mention in previous interviews that because Above is such a different book that you weren’t certain it was even going to sell? What kind of experience did you have trying to sell it? Did it sell right away? Did you get frustrated that people couldn’t see your "genius/vision"? To be clear, right off the top: I don’t really believe in that “you just can’t see my genius!” idea, even though, yes, it’s everywhere. Editors are very smart and perceptive people, and they’re on your side: they want the book you sent them to be good, and they want it to work, because they love good books so much they spend their entire workdays finding and improving them for readers. When they say no to a piece of writing, usually it’s for a reason, and in my experience the reason usually isn’t that I, the author, was just too smart for them. It’s usually because it either doesn’t fit what their readership wants, or there’s something the book isn’t doing as well as it could -- and it’s a big enough problem that they don’t think we could sit down together and fix it. That’s all. So while thinking they’re just not getting the vision is…well, I suppose it’ll make the author feel better about himself or herself for five minutes? It doesn’t fix the problem of why people aren’t connecting with a book, and feeling better about yourself at someone else’s expense doesn’t sell books; fixing the reasons people are putting them down does. So when we were out on submission with ABOVE and getting a small stack of very, very nice rejection letters (they were really very nice), I did get frustrated, yes: but I got frustrated with myself. I felt like I had done my very best with this book, and about three months into submissions, I started thinking my best might still not be good enough. ABOVE is a difficult, prickly book, and I know it; it’s the kind of thing a lot of people are going to be confused by, or hate. I worked hard to make it connect with readers too, and I hit the point where I couldn’t find one more thing that would help the book connect better. And if I couldn’t find that, couldn’t make it a better book and fix the things that were making those editors say no, then maybe this was a sign that I wasn’t ever going to have the skill to make the stories I wanted to tell accessible to people who weren’t me; that maybe this whole writing thing, on a very practical level, just wasn’t going to work. I didn’t know how to get better. I didn’t know how to write better. That was frustrating, and it hurt. I was wrong, of course. You usually are when you think you can’t ever do something. The book sold after six months on submission, and it was very much to the right editor, and the right publisher: one who loved it, and who could see how we could improve the things that were making it not connect with some people. And then we improved them in ways I would have never even dreamed of, and I learned some more things about good writing during that process: I learned how to get better. I still am learning that, every day. And I don’t expect to stop. Since you love tea, we’d like you to put the following five teas in order of what sounds most tasty. Amandine Rose Black Tea, Earl Grey Tea, Jasmine Oolong Tea, Honeybush Vanilla Herbal Tea, and Dragonwell Green Tea. You may also add your favorites in, if you’d like. Oh, tea question! Awesome! I’d have to go with the Amandine Rose, Jasmine Oolong, Earl Grey, Dragonwell Green, and then the Honeybush. I like florals, but I’m not so great with sweet. Current favourites, though: There’s a local tea shop called Herbal Infusions that one of my friends discovered, and they make these amazing, kind of offbeat blends. I’m working through two of theirs right now. One’s a spicy cherry rooibos, which is just sheer amazing, and the other? Orange creamsicle. Seriously. It tastes so much like a real creamsicle you can almost taste the popsicle stick, and that’s just magic. When did you decide you wanted to be an author? What was it like taking those first steps? I don’t think I ever decided I wanted to be an author. I wanted to write. Sending out what I wrote for publication was kind of a side effect of that, because when you’ve written something you’re proud of and you think it’s good, putting it in a drawer seems like a bit of a waste. Also, I was in my first year of university and terminally broke, and anything that helped pay the power bill was worth doing. This will sound maybe really flippant, but no, really: that’s how it started. I was poor, and there was a chance to make that less bad with this thing I was already doing just for the love of it. But there was no decision; no day where I sat up and said “I’ve decided that I want to be an author and am going to make a career plan for it.” I just sort of drifted into it. One day I was puttering around with writing in my spare time; a year or two later I woke up and realized that submissions, wordcounts, editing, conventions -- this was my life. It had happened sneakily, bit by bit, like all the best things do. I don’t really have a favourite; I have lots of books I love, for different reasons. I think I’ve read too many books for favourites! The thing I fell in love with last, then: Zoe Whittall’s HOLDING STILL FOR AS LONG AS POSSIBLE. I could say it’s because it’s set in my city, in my neighbourhoods, and about people who are so very much me and the people I know and care about; or that she’s just an amazing, evocative, smart writer. But really it’s because it was the exact book I needed at the exact time I needed it, and I didn’t even know that when I picked it up. Have you been reading the reviews ABOVE has gotten or do you not care? If you don’t mind, I’d rather not answer this one. People put a lot of work and thought into writing reviews of books, and if I say I don’t read them, then that’s a bit of a slight to the work they’ve put in. That work does matter, and brushing it off is unkind. On the other hand, reviews are also a place where readers can talk about books between themselves, honestly, and if I say I do read them, then it’s possible it’ll feel like the author’s looking over their shoulder or spying or something. I don’t want to stop readers from being able to have complete conversations about the book, or change what they’re willing to say just by them knowing I might be there. So it’s a bit of a no-win question, unfortunately, and if it’s all right, I’d rather keep the issue of whether I read reviews of ABOVE strictly to myself. For this Feature Friday giveaway, Leah has sent me two copies of Above. The giveaway is going to be held from April 27th to May 3rd. You may enter below. Above: Matthew has loved Ariel from the moment he found her in the tunnels, her bee’s wings falling away. They live in Safe, an underground refuge for those fleeing the city Above—like Whisper, who speaks to ghosts, and Jack Flash, who can shoot lightning from his fingers. But one terrifying night, an old enemy invades Safe with an army of shadows, and only Matthew, Ariel, and a few friends escape Above. As Matthew unravels the mystery of Safe’s history and the shadows’ attack, he realizes he must find a way to remake his home—not just for himself, but for Ariel, who needs him more than ever before. Enter the giveaway using Rafflecopter. Hit the green "Do It" buttons, follow the prompts, and hit the green enter buttons when you're done. (You may have to log in using Facebook to do this). There will be two winners (selected by Rafflecopter). I will contact the winners via email. This contest is open to international entrants. I'm giving you a big, positive hug then! :) Best thing ever. So Leah, the cover for ABOVE is simply amazing and the story sounds great! A.L. Davroe, I just adore you steampunk outfit from the pic here on your blog! I'll give you both prayers and good thoughts. Thanks for another giveaway! I'm always down with sending out positive thoughts and energy into the world. I don't know where you live but if you are suddenly hit in the face with the smell of coffee but not a drop is around that is my positive energy finally reaching each of you. "Once in a while right in the middle of an ordinary life love gives us a fairy tale"
Oh, I do like that one! Thanks for the double good thoughts! Thanks for everyone's good thoughts so far! Leah's just rounding out on her first month of being published and that's the most crucial month for a debuting novel. My own YA novel is on submission with publishing houses and everyday I hope for that "yes." We both appreciate your good vibes! I'm sending some positive energy to you guys:)!!! GOOD LUCK!!!! This book is on my wishlist already. It sounds great and that cover is beautiful! Good luck to both of you :D And thanks a lot for the giveaway!